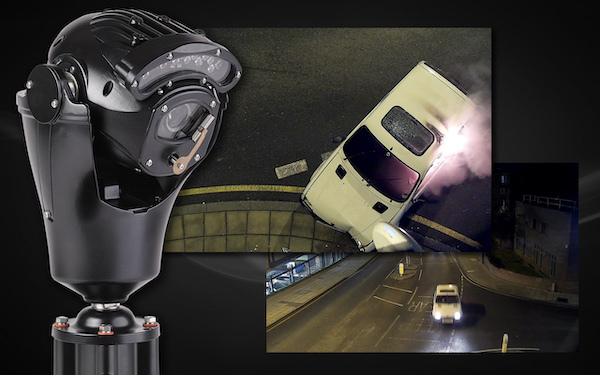 The rugged build quality of the new Invictus PTZ camera from UK CCTV manufacturing company, 360 Vision Technology, has been proven in the field during a recent road traffic incident in north London, which provided a real-world test for the camera and its ‘Attack Detect’ response feature. Built into each Invictus camera, 360 Vision’s ‘Attack Detect’ automatically responds to a detected increase in camera load (such as the camera being hit by an object). On detection, the camera’s direct-drive Pan & Tilt mechanism is instantaneously disengaged to prevent damage to the motor drive. A self-check routine then establishes if the camera has altered its direction of view during the attack, and an automatic re-initialisation is triggered – returning the camera to its last known position prior to the impact. The benefits of Invictus’ Attack Detect response to system operators is that post-attack, the camera will always return to its correct field of view, prior to being forcibly moved. This means that vital evidential footage will continue to be captured, and without the need for operator intervention. The feature also ensures that all camera-preset positions remain intact, vital to avoid disruption to the daily running of the system due to inaccurate preset positions. Talking about the crash incident, Aaron explains: “The Invictus camera’s Attack Detect response proved itself invaluable in the ultimate impact test, when a speeding vehicle hit the camera’s column at high-speed, after leaving the road and mounting the pavement. Due to the quality of DSSL installation and 360 Vision’s Invictus, the camera not only stayed attached to the column mount, but also remained fully functioning. “The camera column was hit so hard that the camera head turned over 180 degrees. The anti-attack system released the camera’s drive mechanism as soon as the impact was detected, allowing the camera to move freely. After a few seconds, the Invictus completed a self-test to return to its original position and continued to record evidential incident footage of the aftermath of the crash. “Public space CCTV and cameras securing perimeters typically operate adjacent to roads, with an ever present risk of impact from vehicles, either accidentally or maliciously,” says Adrian Kirk, Directorat 360 Vision Technology. “Installing Invictus ruggedised cameras into these locations provides customers with a ‘fit for purpose’ roadside solution that ensures continued performance, even under attack."